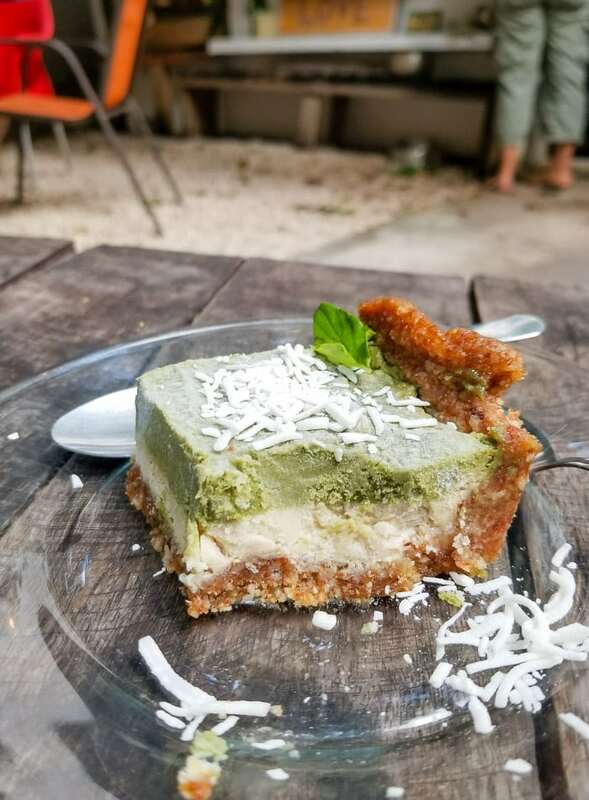 I just got back from a 9 day trip to the Mayan Rivera and am happy to report there are a ton of options for vegan food in Tulum and Playa del Carmen, Quintana Roo, Mexico. Not only that, almost every restaurant I visited had vegetarian options on the menu or were happy to make me something vegetarian if they didn’t. 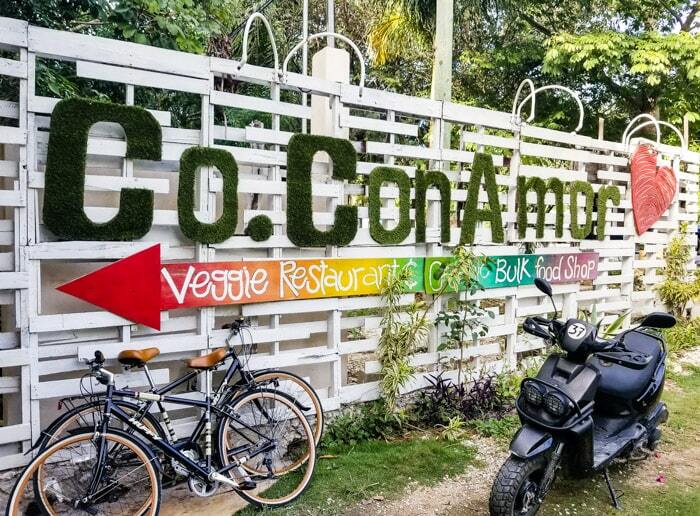 From The Pitted Date in Playa del Carmen to Raw Love in Tulum, if you’re heading to the area you’re in for some delicious plant-based meals. 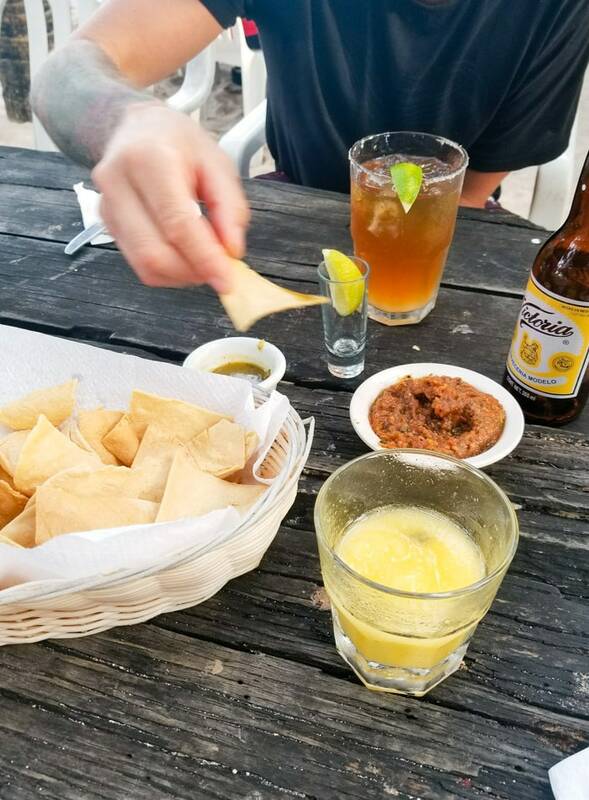 If you do find yourself stuck for options, don’t worry, there’s always tortillas, guacamole and pico de gallo with a cold cerveza on the side. 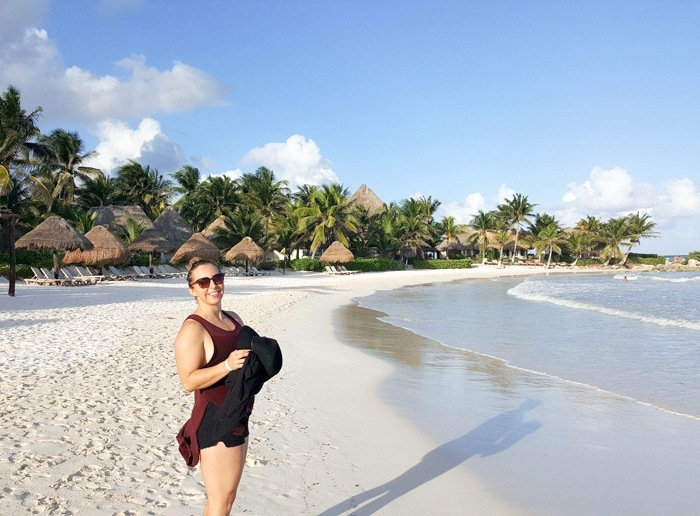 During our 9 day stay, we went to Tulum three times, Akumal a number of times, Playa del Carmen twice and ventured up to Puerto Morelos once. 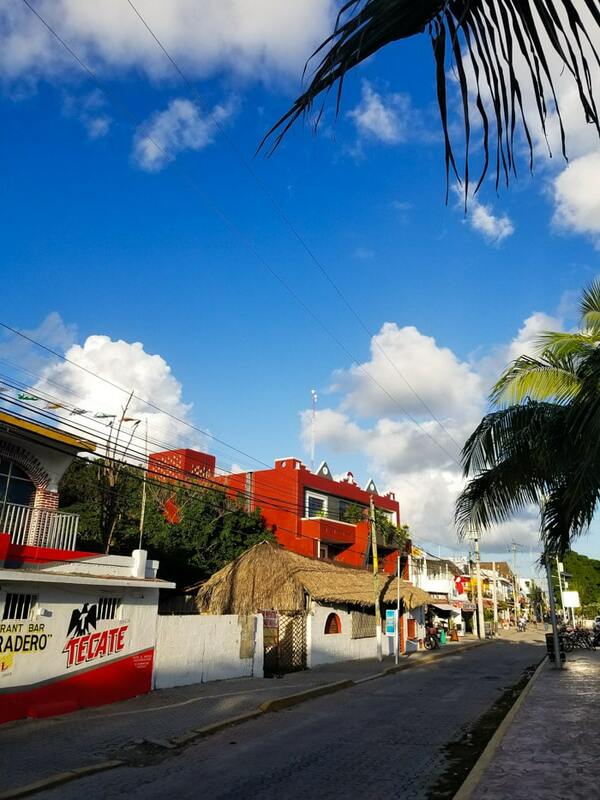 Tulum Pueblo and Puerto Morelos are my favourite spots in the area. 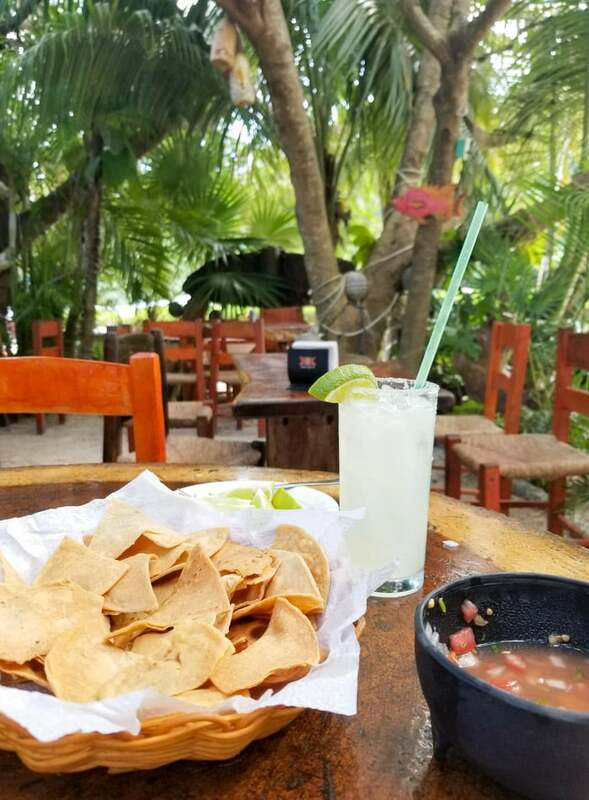 I love the beach and quiet, chill atmosphere in Puerto Morelos and Tulum has so many good places to eat. 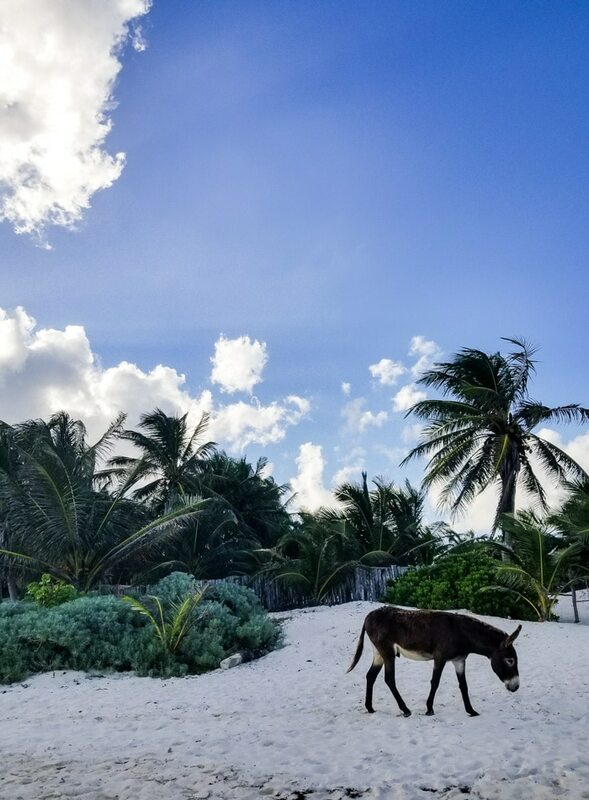 The beaches in Tulum are also incredible. 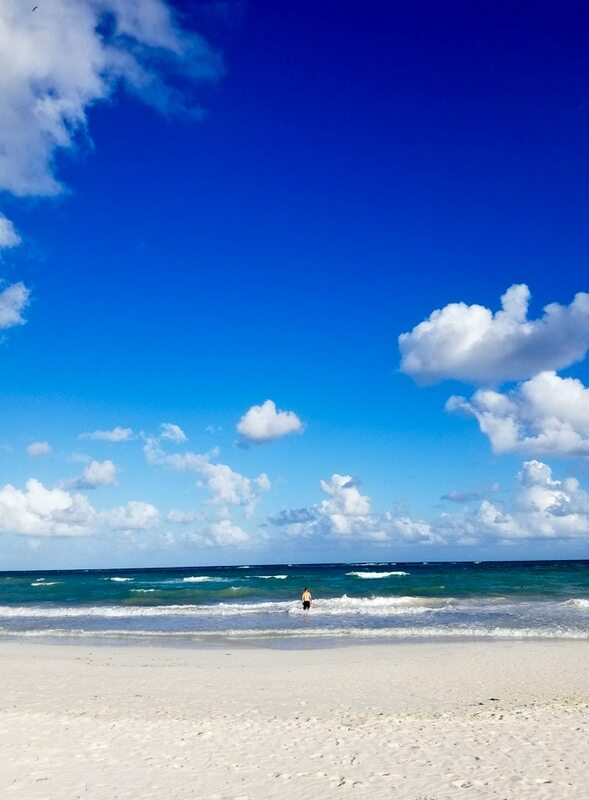 Playa Paraiso and Tulum Beach are both beautiful and they’re so big they never feel busy. 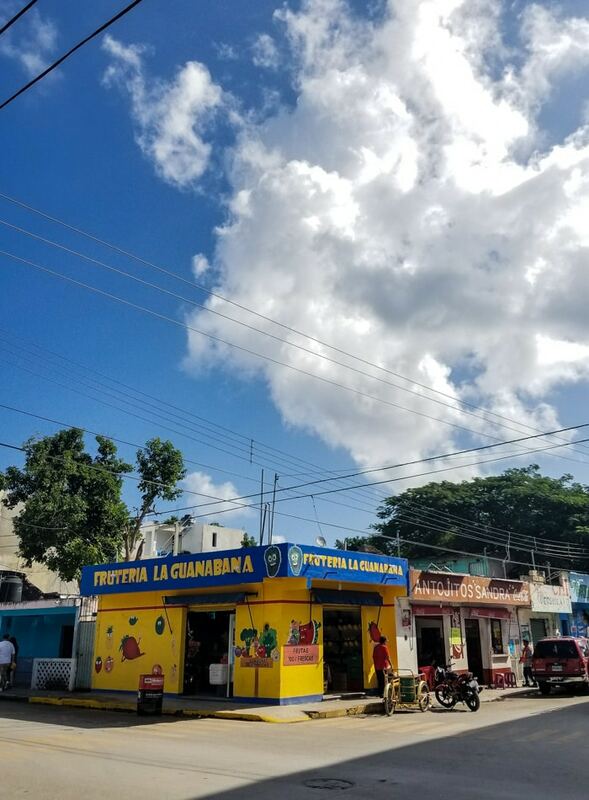 I don’t really like the main shopping street in Playa and it definitely doesn’t have the best beach in the area but if you get off the main street and there are tons of great places to eat and drink. 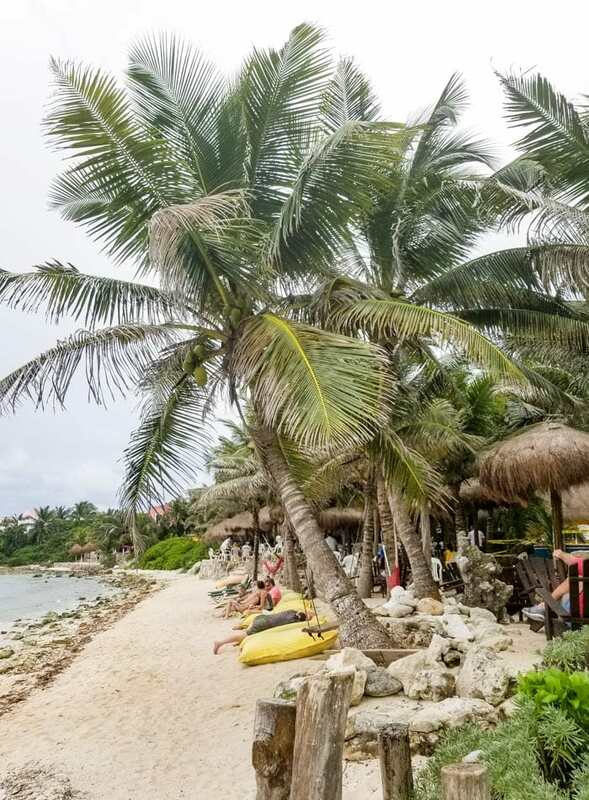 Akumal is great too, the main beach is busy but beautiful and we like to visit La Buena Vida on the lagoon side for Happy Hour drinks. 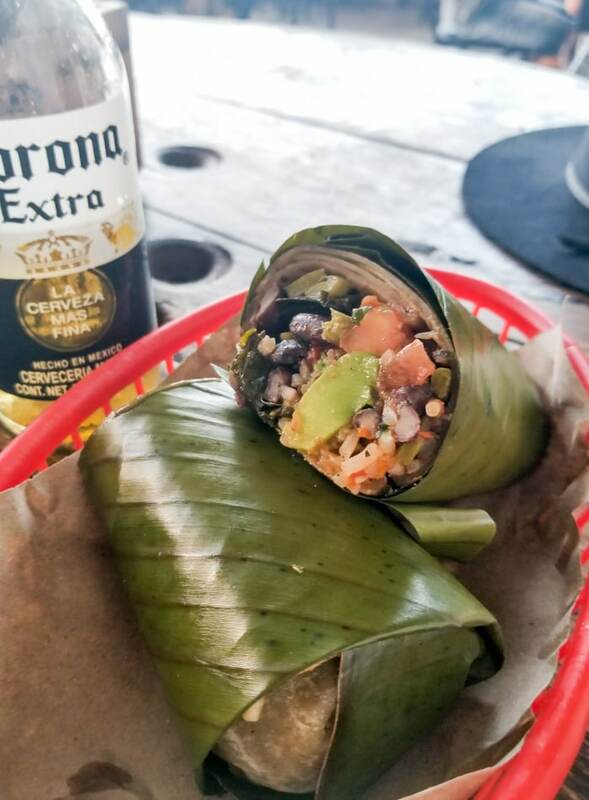 Tulum is not without delicious vegan and vegetarian options both in town and down on the beach. 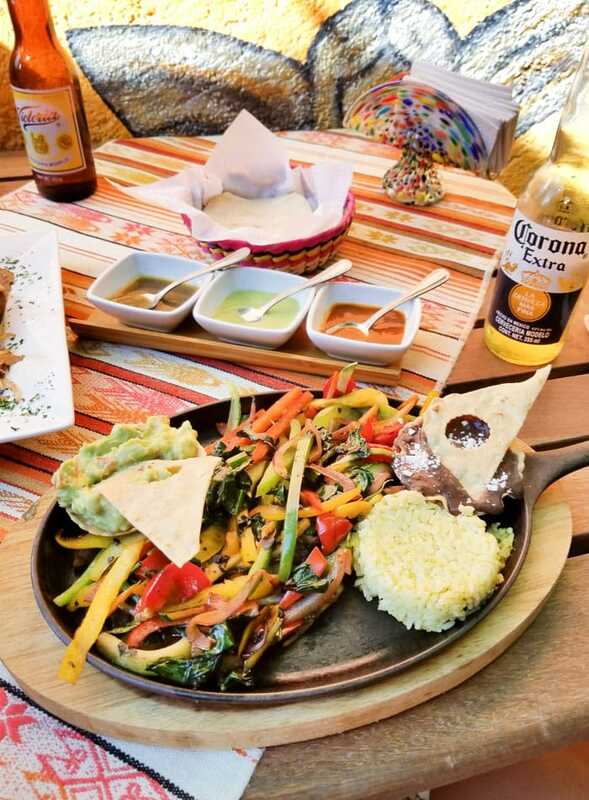 There are many amazing places to choose from such as Restaurare, Co.Conamor, Raw Raw Love and La Hoja. 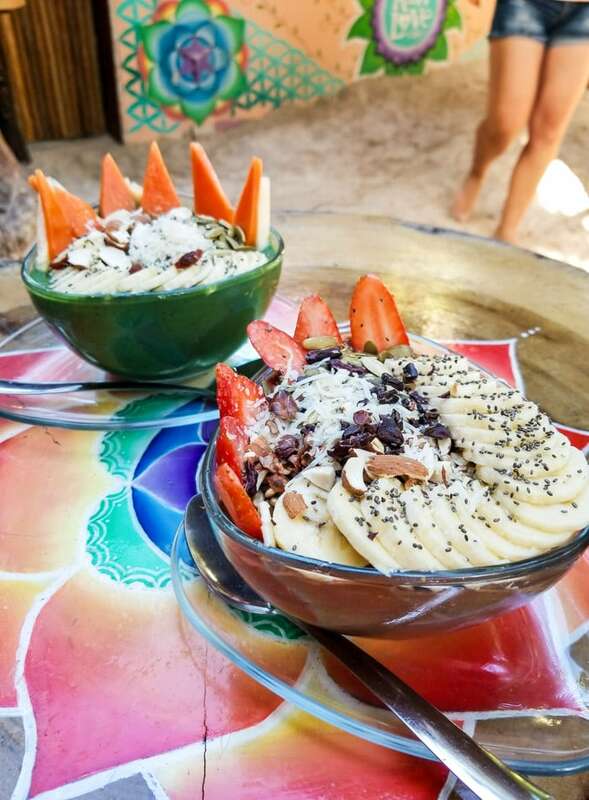 Raw Love is a raw vegan restaurant located on Tulum Beach, about a 5 minute drive from Tulum Pueblo. 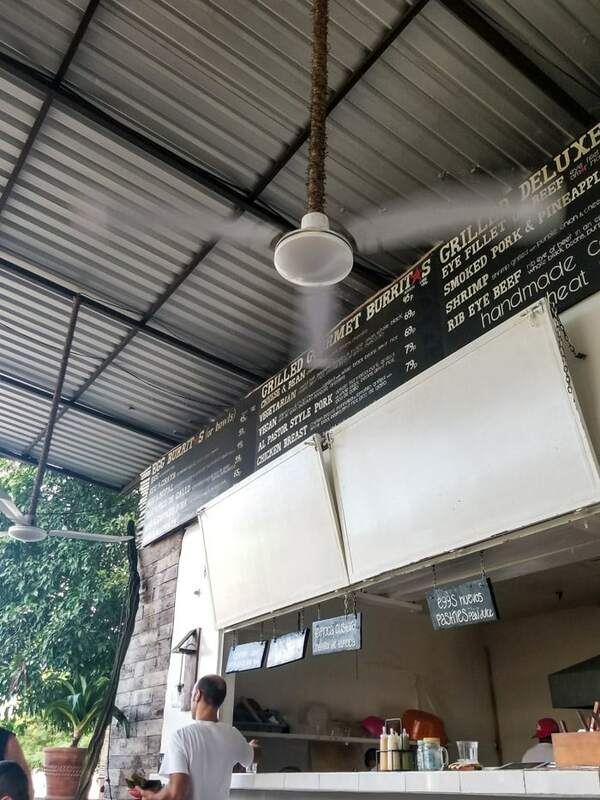 It’s located in a beautiful, garden jungle setting just back from the beach but not so far that you won’t be enjoying your meal with your feet in the sand. 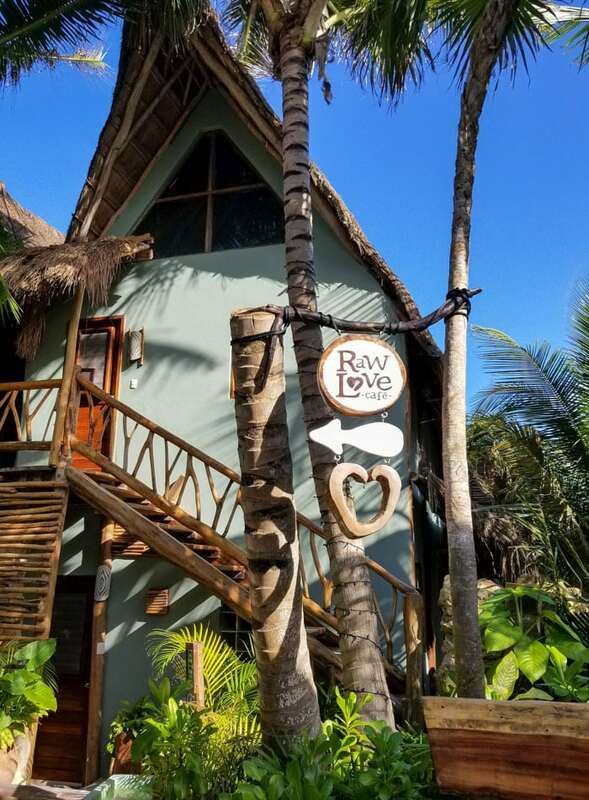 Raw Love is located in the Ahua Tulum Hotel, just walk into the hotel from the beach or the road and follow the sign to Raw Love down some steps to the right if you’re coming off the beach. I wish I’d had time to visit Raw Love more than once. As we were there mid-morning, my husband and I both had smoothie bowls but the rest of the menu sounded amazing too. Co.Conamor was one of my favourite spots we visited. 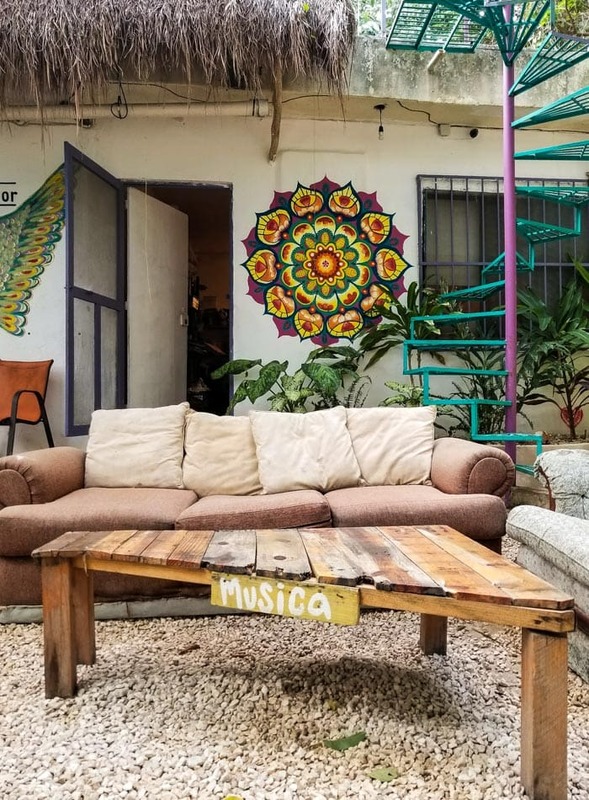 I loved their chill garden setting where you can relax on a couch sipping a coffee, smoothie, kombucha or juice. We went for dinner and I had the Morrocon Love plate while my husband had the Veggie Wok and added marinated tofu and peanut sauce. Both dishes were delicious. We ordered coffees and energy balls to start, my husband had an Americano and I had a soy Beetroot Latte and we finished our meal with a raw Matcha and Cashew Pie. They also have vegan ice cream and a range of other desserts. 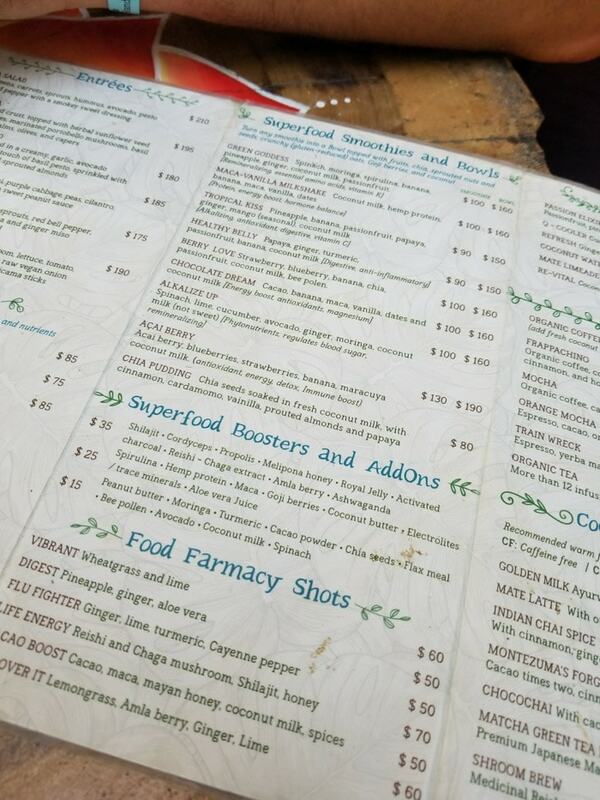 The menu is extensive and I wish I’d made it there more than once, especially for breakfast. I’d highly recommend adding Co.Conamor to your plans while you’re in the area. 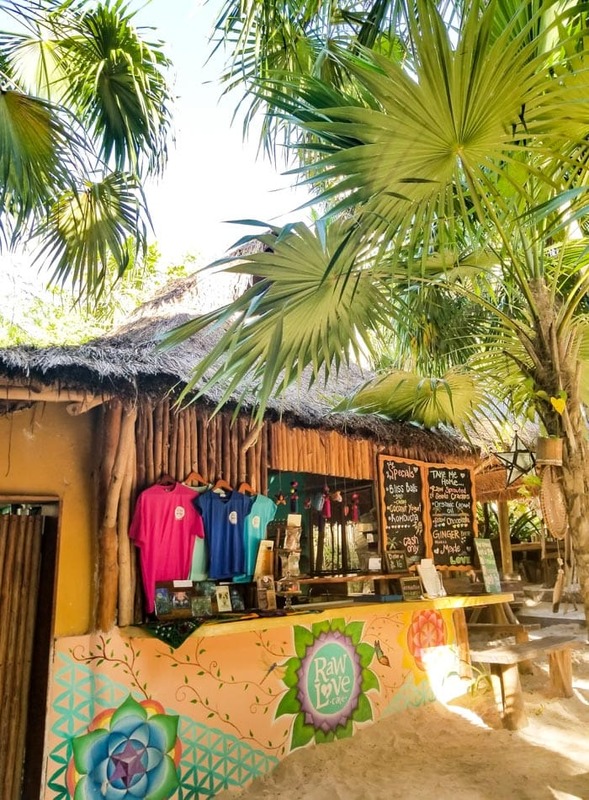 There’s also a little bulk food store in the back, so if you’re in Tulum for a while and need to stock up on anything from spirulina, to loose leaf tea and maca, you can do it here. 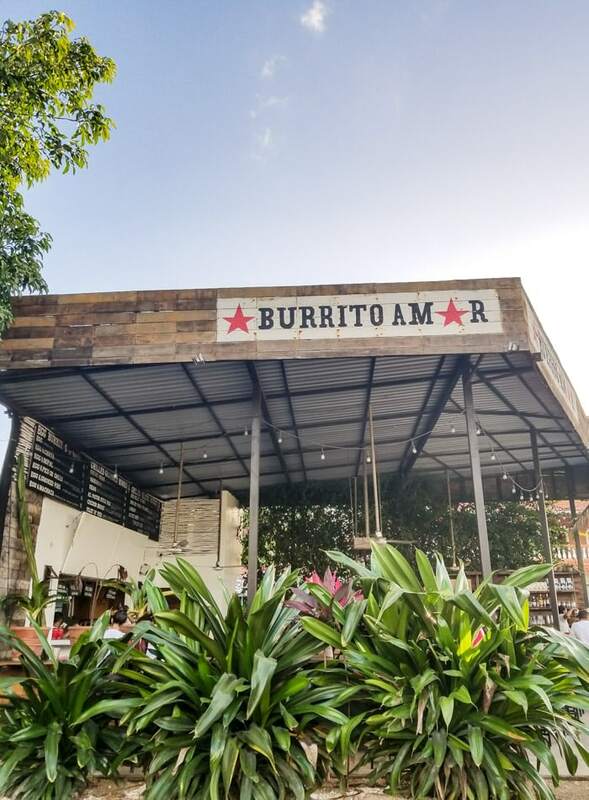 Burrito Amor is an open-air burrito joint located to the southern end of Tulum Centro and has something for everyone. We found the food to be delicious, the service to be prompt and friendly and the prices to be reasonable. I loved my vegan burrito and the handmade coconut tortillas were unreal. They also had a vegan cactus salad on the menu I’d love to try next time. 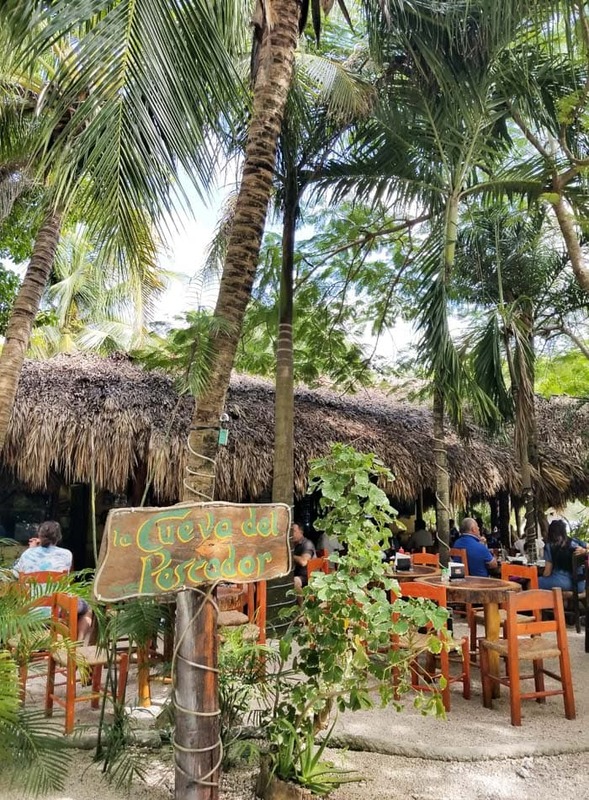 Restaurare, Tulum Beach. Amazing reviews and I can’t wait to visit next time. 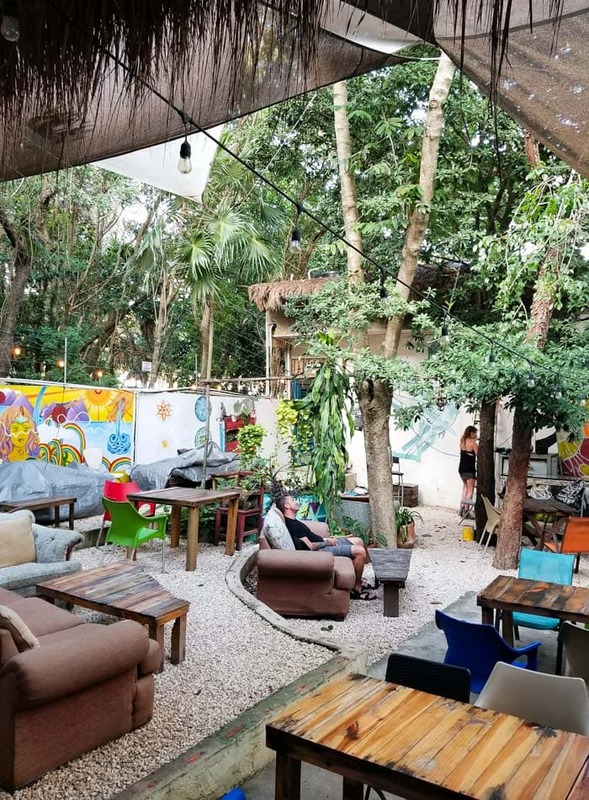 They serve creative plant-based Mexican food, breakfasts and desserts in a garden setting near the beach. Top of my list for next time! La Hoja, Tulum Centro. I hadn’t heard of this one and just noticed it as I was walking by. It’s just off the main street in the town. 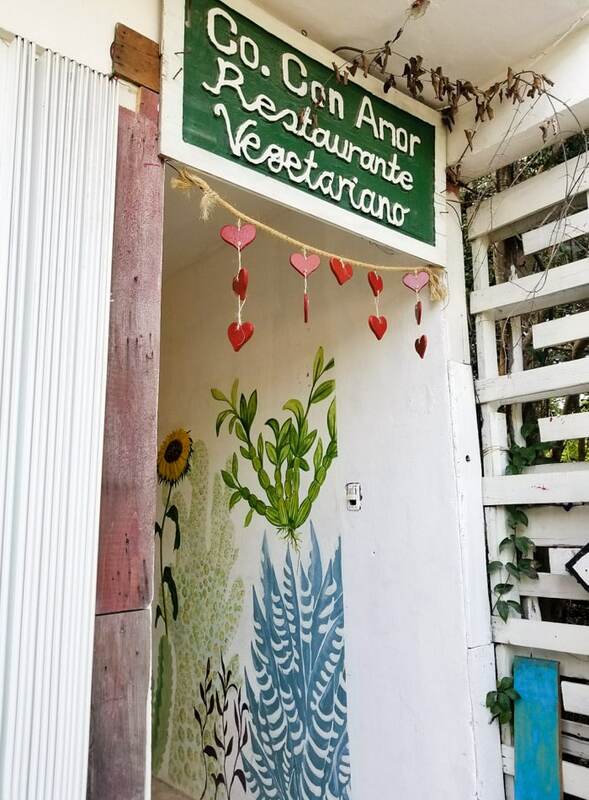 El Vegetariano, North End of Tulum Centro. They have really good reviews and from what I can tell it looks delicious! It’s an open air restaurant near the San Francisco supermarket and they have everything from salads to sandwiches on the menu. Too many places to try, too little time! If you’re in the area and are able to try any of these let me know how they are. 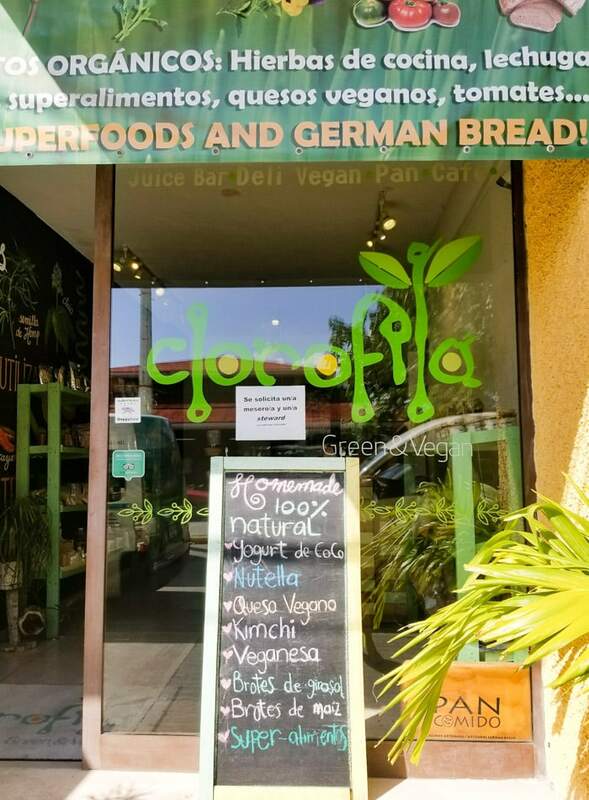 Plant-based eating is taking off in Playa del Carmen and we had a chance to stop by two of the best options for vegan food in the area. The Pitted Date has just moved to a new larger location located on towards the far northern end of the main shopping street. We walked from the collectivo station at 15th and 2nd which is about 2.5 kilometres, or a half hour walk. We only had time to go once but I wished I could have eaten there everyday. They are just a few minutes walk from the beach too, so you can pop down for a swim after your meal. 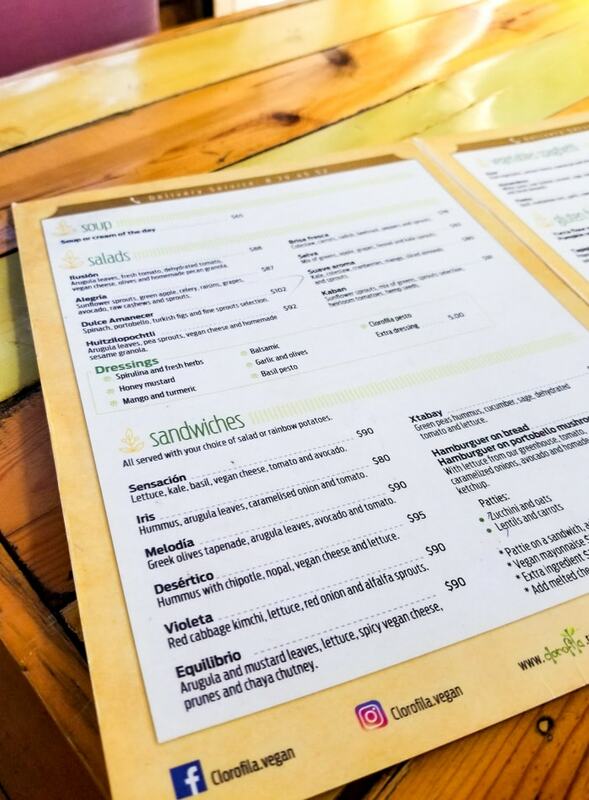 The creative and delicious vegan menu is amazing and features everything from breakfast burritos to brownies. I had the huevos rancheros which was awesome, I really enjoyed their creative egg alternative, and my husband has the raw pad thai, which I probably stole half of. We also had the raw carrot cake, a must, and I had a vanilla frappe. If it wasn’t 30 degrees that day I would have been all over the almond mylk lattes. Desserts include chia pudding, chocolate cakes, brownies and more and they all looked fantastic. They’ve really developed an incredible menu. The owners and staff were very friendly and service was prompt. 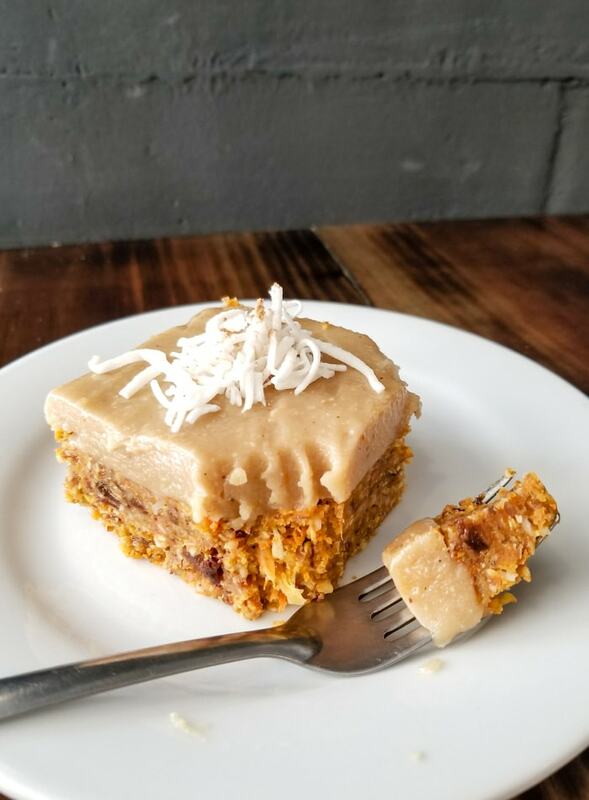 Whether or not you are vegan or even vegetarian, I’d highly recommend stopping in for a delicious meal, treat, coffee or snack. I got a peek at the paninis, waffles, omelettes and breakfast bagels and they all looked incredible. As did the smoothies, coffees and juices. Clorofila is located a bout a 10 minute walk up from the main shopping street. 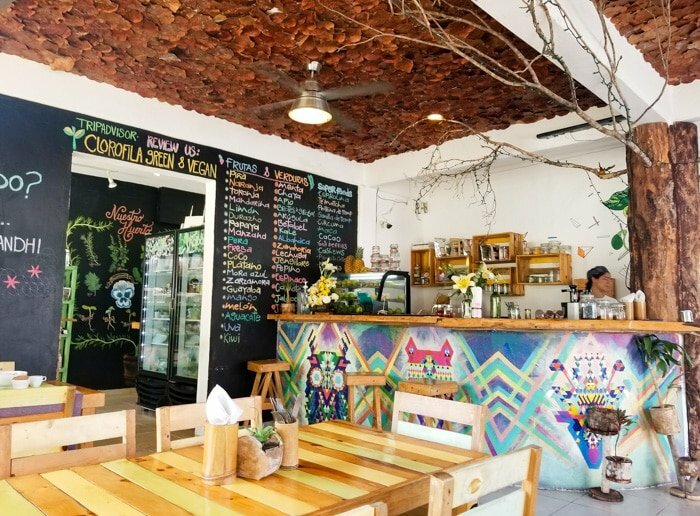 The small cafe is bright and colourful and they have completely vegan menu full of raw and cooked dishes including gluten-free pizza, pasta, smoothies, sandwiches and breakfast. 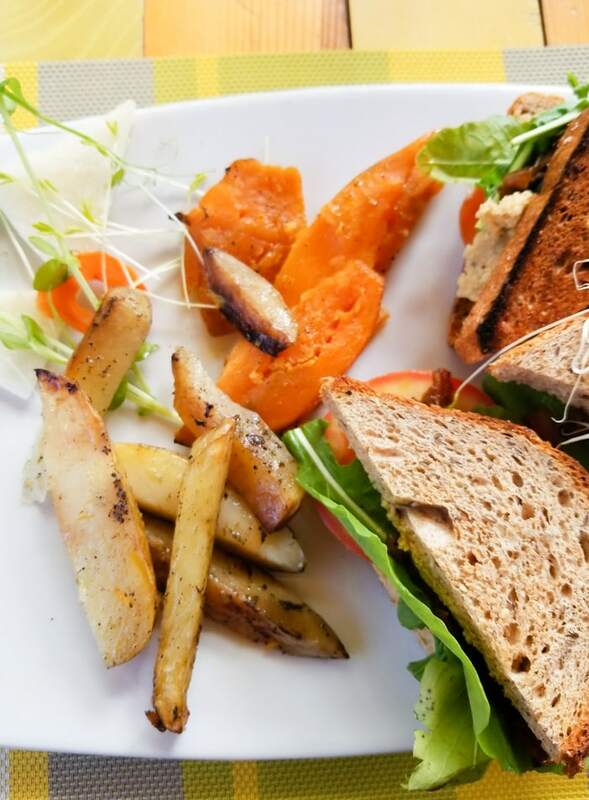 We both had sandwiches, which were huge and filling and came with lovely steamed potatoes and sweet potatoes. I had a smoothie and my husband had kombucha. If those sandwiches hadn’t been so filling I would have made another stop in the afternoon but I was so full! It was really good though and would recommend stopping by for lunch or a healthy drink. 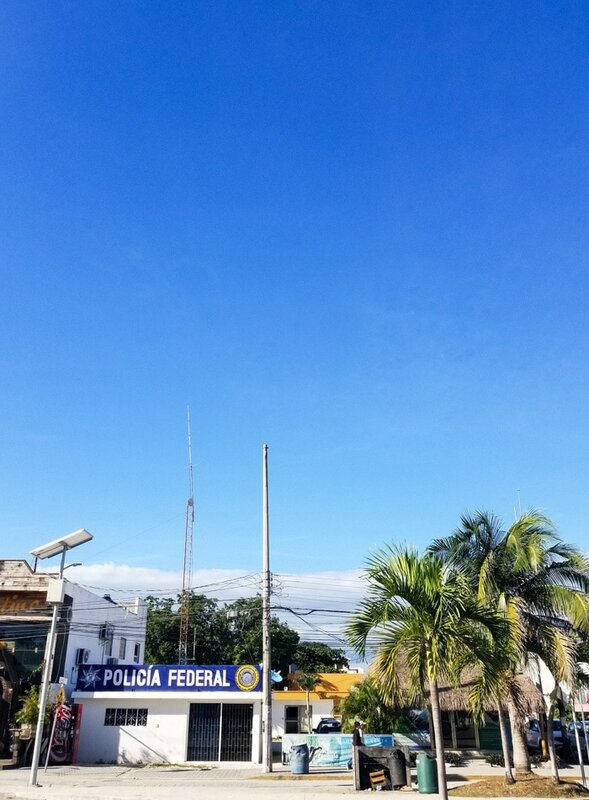 La Senda. I really wanted to stop here but we didn’t end up making. 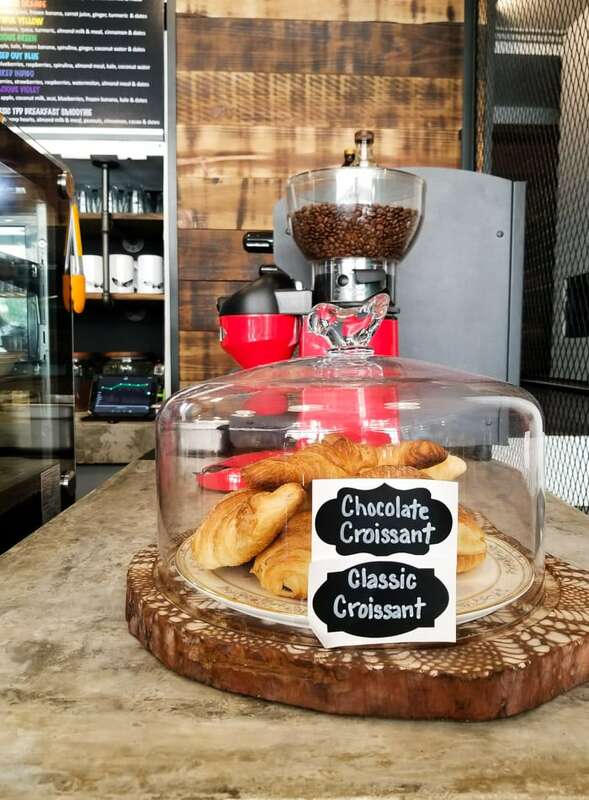 It’s located right in the main area and features fresh vegan Mexican food and other creative dishes, coffees, desserts and more. Aloha Raw Bar. Just up from the main walking street. Fresh smoothies, bowls, drinks, coffees and breakfasts. Reviews sounded great and I wish I’d had time to stop in for waffles. Bio-Organicos. Beautiful fresh bowls, pasta, sandwiches, breakfasts, smoothies and more. I saw vegan nachos on their menu so again, I wish I’d time to make it here. They also have a natural food store with all sorts of healthy goods. 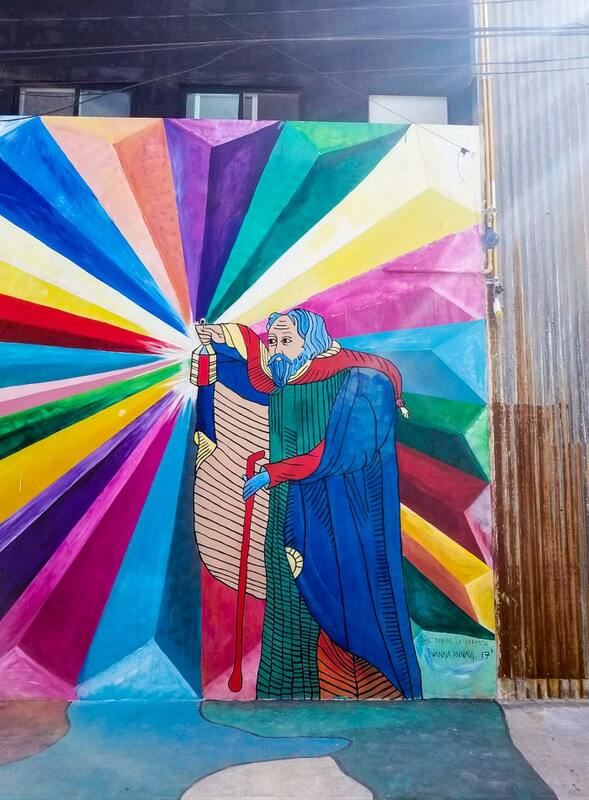 Fresco Habito. 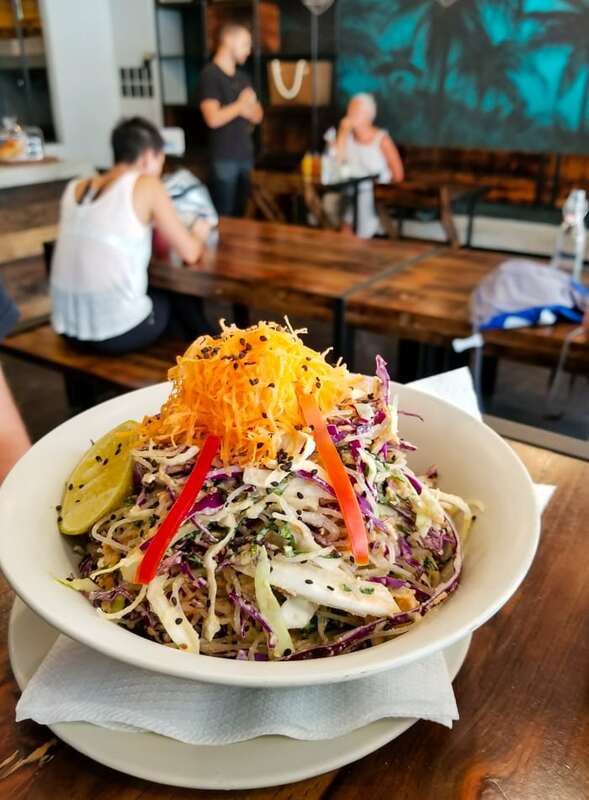 You’ll find this small, popular health food cafe near the North end of the main beach, one block back from the water. We didn’t eat here but we walked by a number of times and the food looked good. 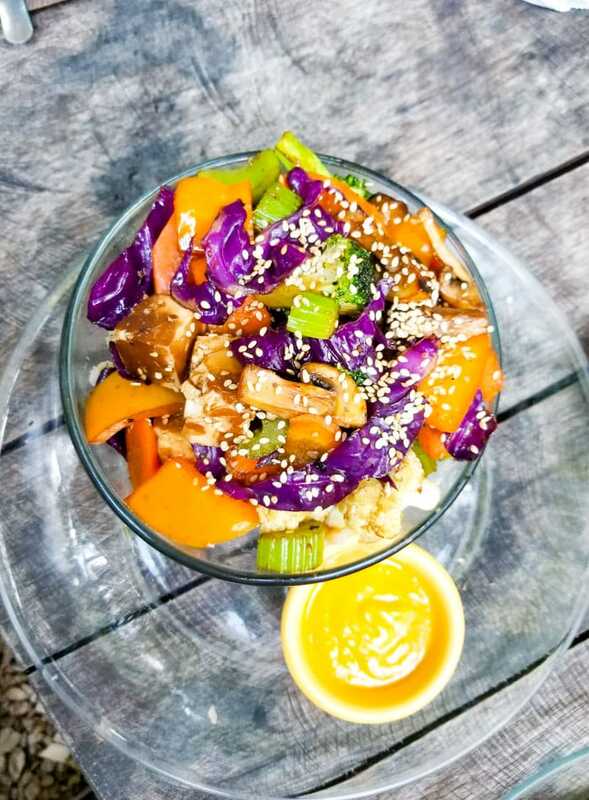 They have healthy salads, buddha bowls, acai bowls, avocado, smoothies and plenty of other vegan options. Those were the rest of restaurants that were on my list but there are plenty more options. If you’re been to any others you loved, let me know about it! 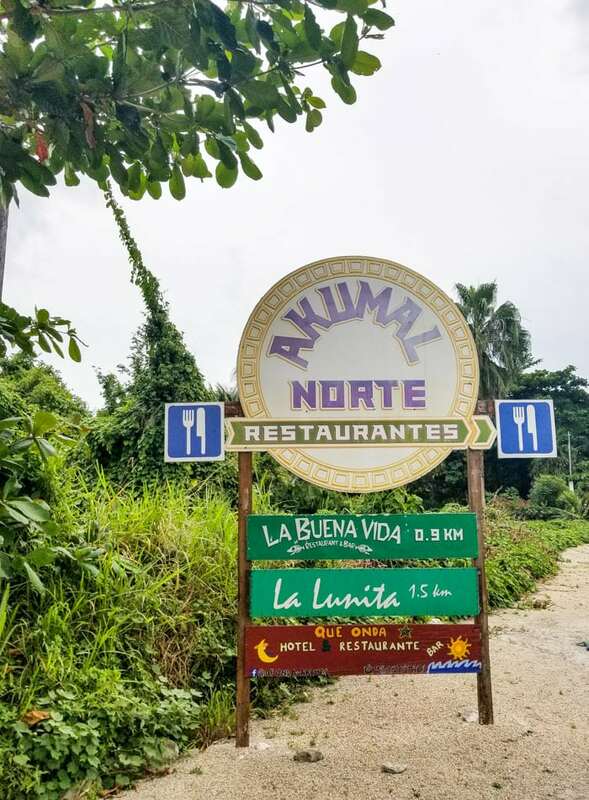 Akumal is small and doesn’t have any vegan restaurants at this time but you’ll have no problem finding some plant-based foods to eat. 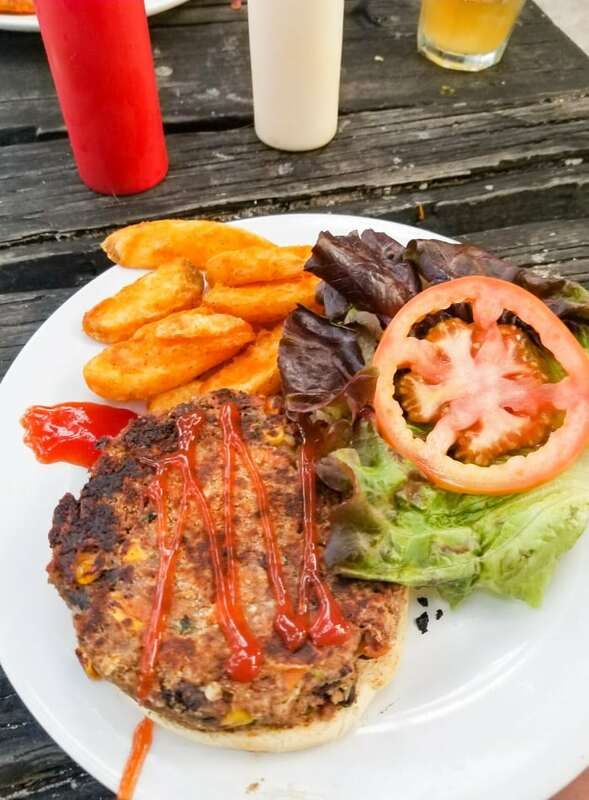 From veggie burgers at La Buena Vida to Superfood Salad and Vegan Ice Cream at Turtle Bay, there’s something delicious for everyone. 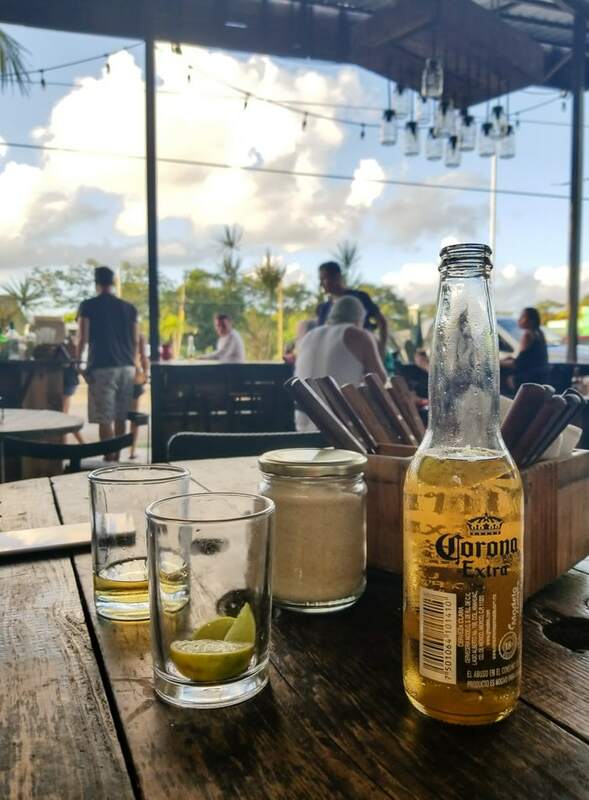 La Buena Vida is one of our favourite spots to enjoy a sunset drink. 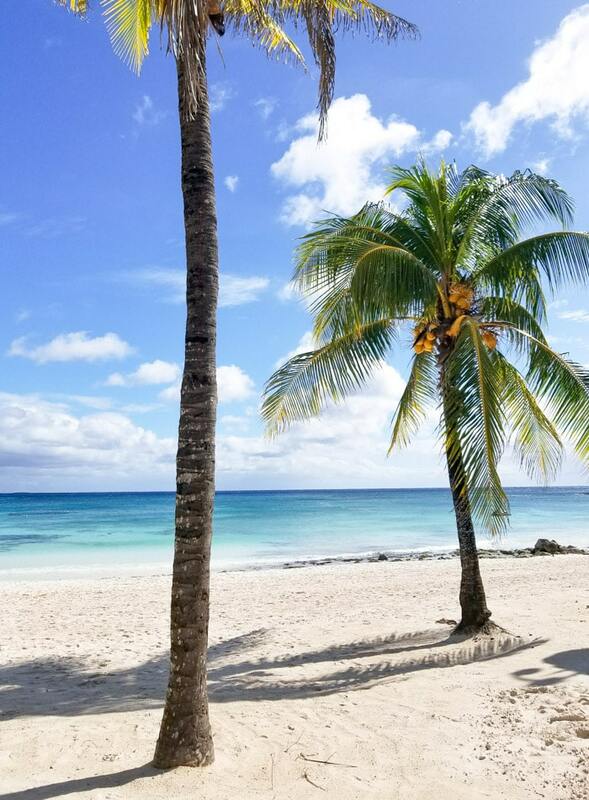 Akumal is located about half way between Playa del Carmen and Tulum. 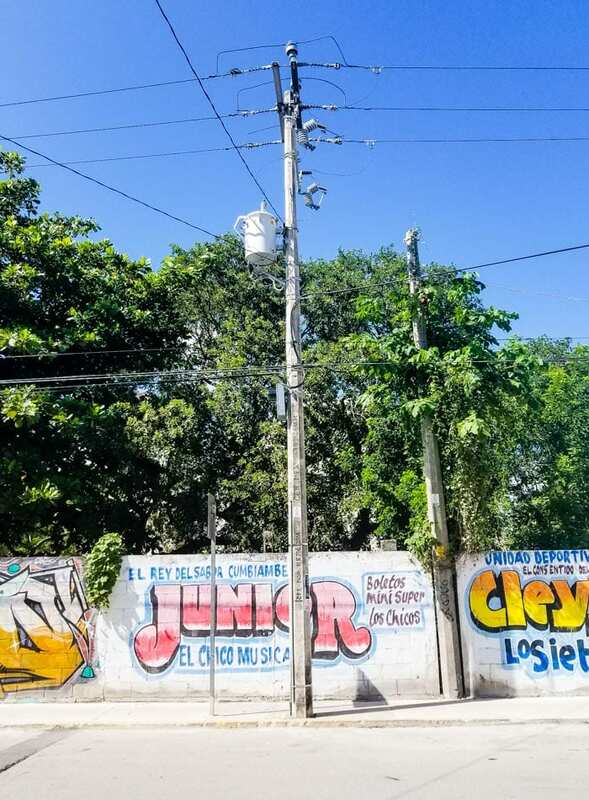 As we use the local collectivos to get around, we get off on the highway and then walk into Akumal. 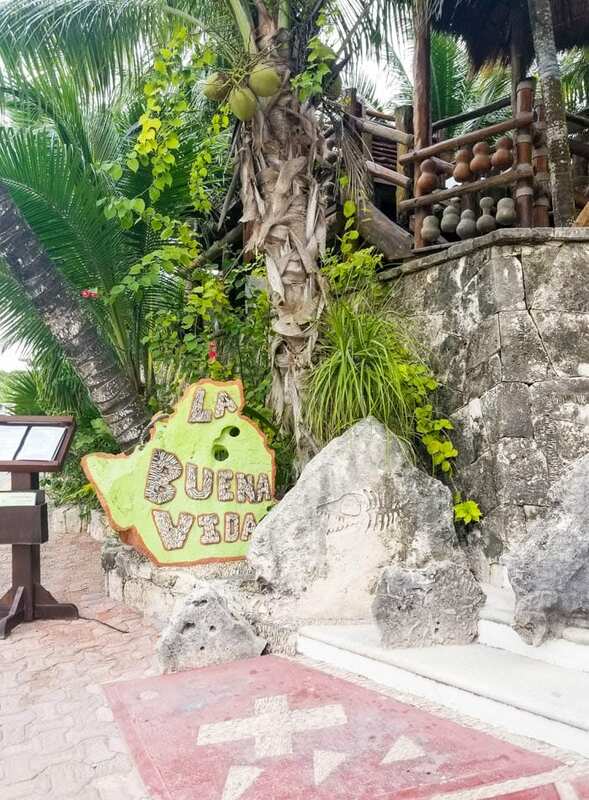 From the highway to La Buena Vida is just under a 2 km walk however it’s not far from the highway to the first restaurants, shops and the beach so we usually stop there for a drink and a swim before walking another 15 minutes or so down to La Buena Vida. 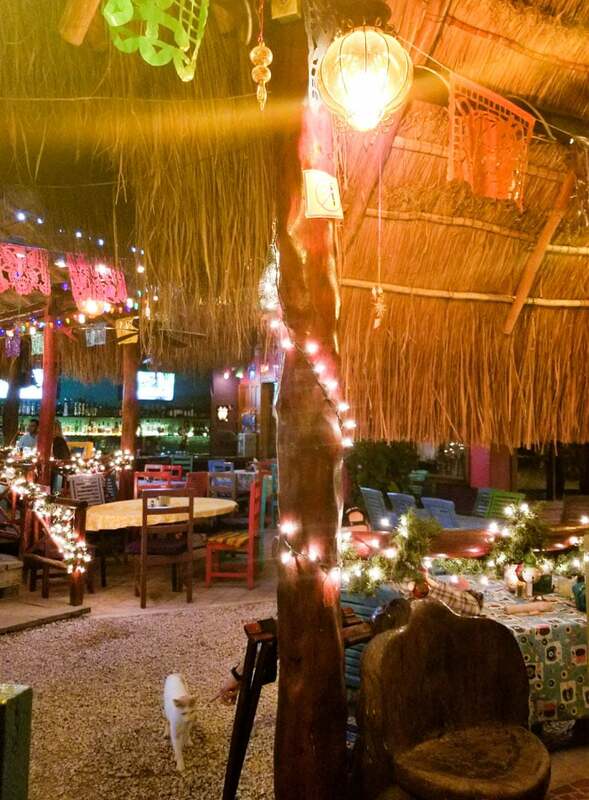 La Buena Vida is right on the beach so you’ll be eating seaside with your feet in the sand. 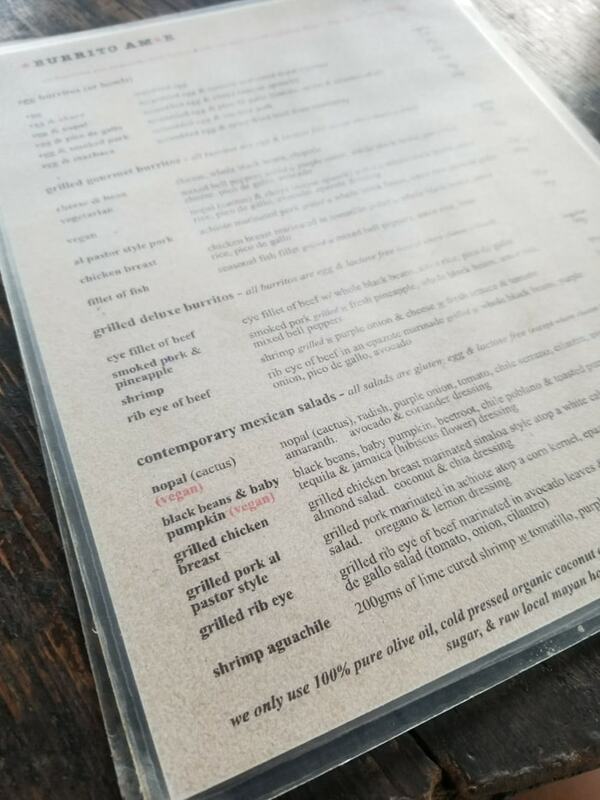 There are a number of vegetarian options on the menu and a couple of vegan options. I had the quinoa burger with fries which can also be ordered as a healthy bowl if you want to skip the bun. There have a bunch of healthy salads too but I was in the mood for a burger and while it doesn’t look like much it was actually really good. 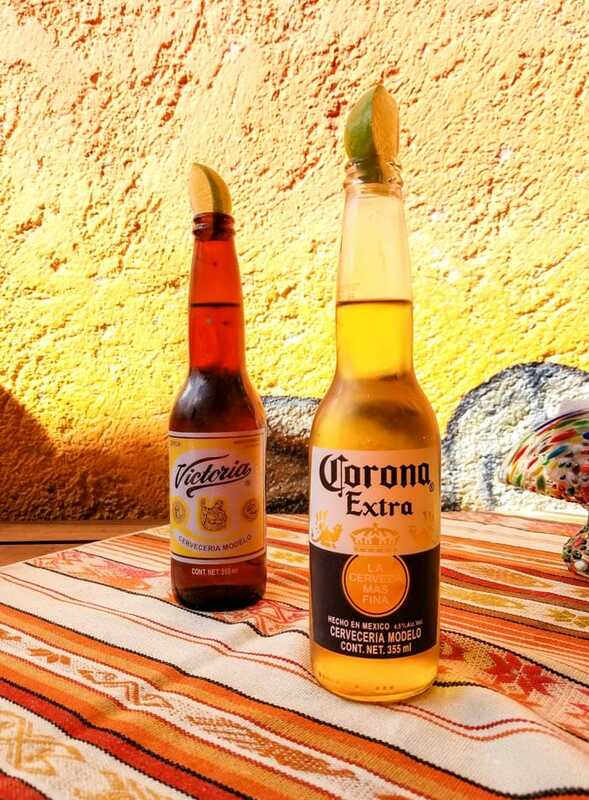 Stop by during Happy Hour from 5-6 pm for cheap drinks, then order dinner and watch the sun go down. 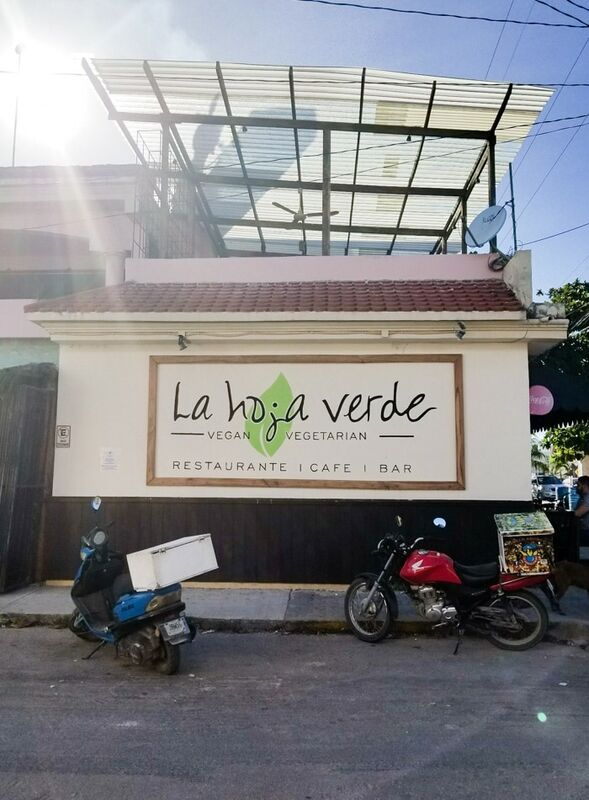 The staff are always really friendly and attentive and every time we’ve been it’s always pretty chill with a nice mix of locals and tourists enjoying their meals. On one of our stops at Akumal we were hot and tired and just needed spot to sit down and have a drink. As it’s a seafood restaurant, they didn’t have any vegetarian options on the menu but I asked for vegetarian fajitas and they were happy to make that for me. There’s always a nice mix of locals and tourists here too and the staff are friendly. 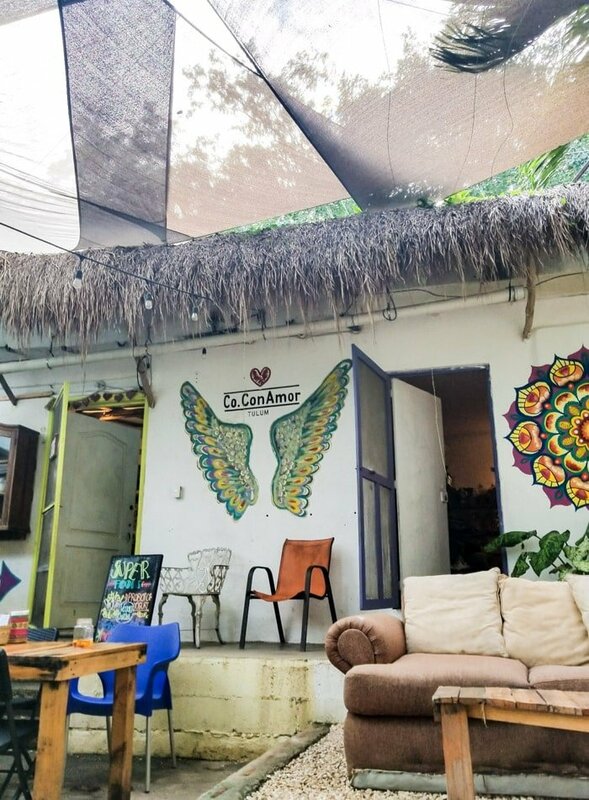 We’ve been there late night for drinks before too and it’s always really friendly and fun with music and a great vibe in the lovely garden setting. We stopped here late night one day so my husband could get some tortilla soup. 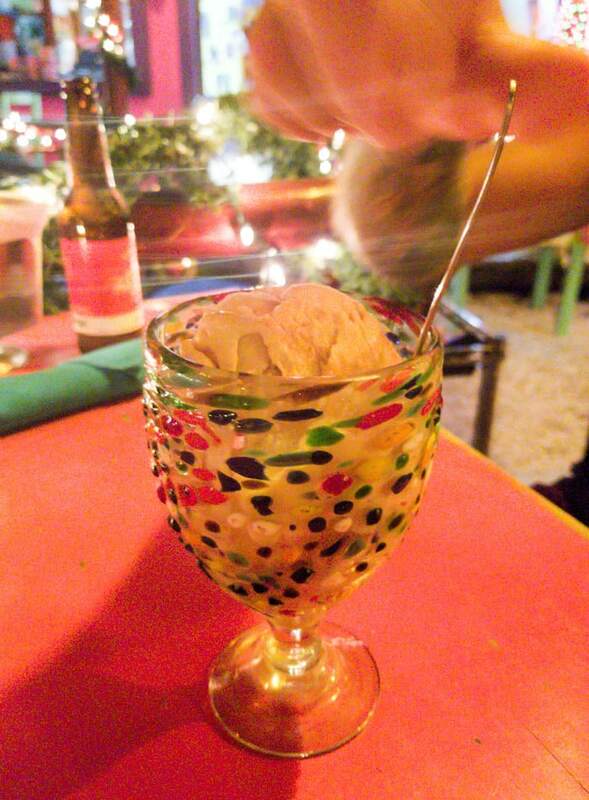 I saw Vegan Dulche de Leche ice cream on the menu so obviously had to order that. I’ve never eaten lunch or dinner there but they have a vegan superfood salad on the menu as well as a veggie-loaded vegan pita with hummus. 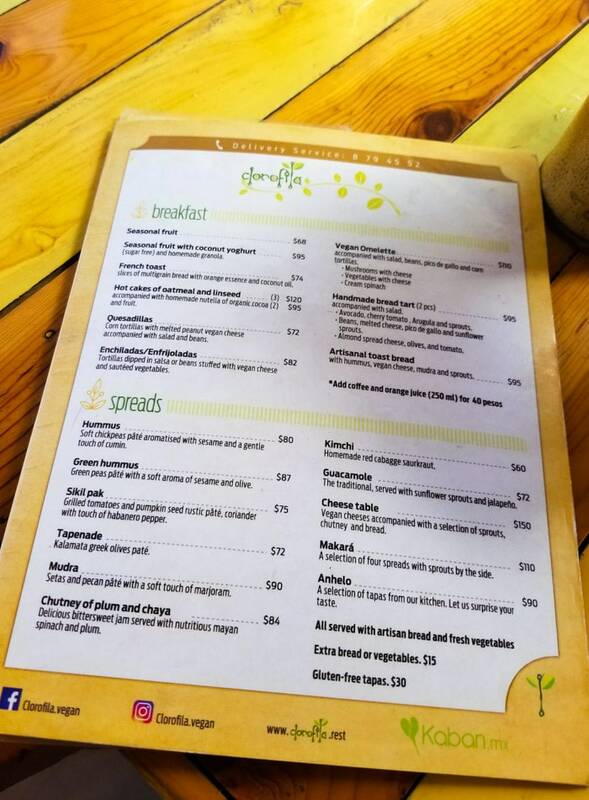 You’ll also find a number of vegetarian options such as flat bread and breakfast veggie hash. 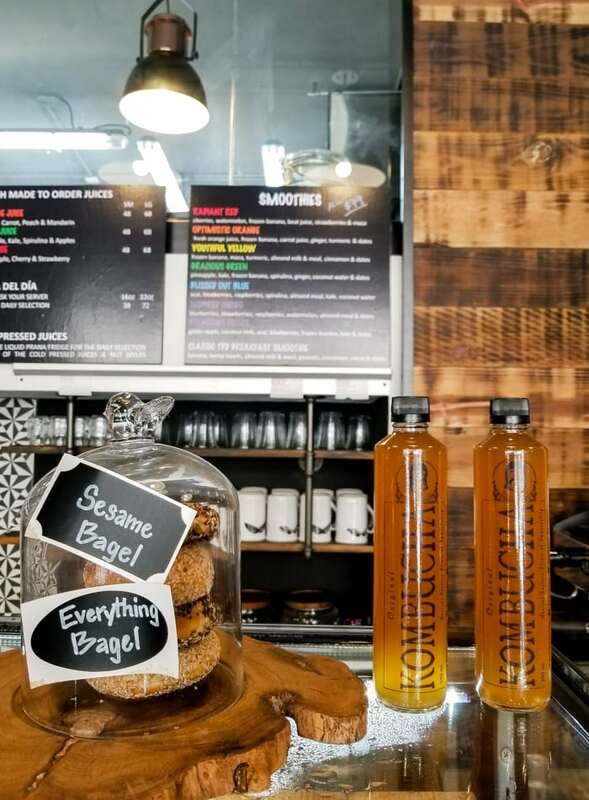 They also have fresh baked bread and baked good you can take to go, and a full menu of smoothies and juices. Plus the outdoor garden setting is super cute and cozy at night when they have all the Christmas lights on. We ate lunch at Dona Triny’s in Puerto Morelos. I had the veggie tacos but I have to say they weren’t very good. My husband loved their tortilla soup though. Although the staff was extremely kind and friendly, I can’t recommend what I had to eat. 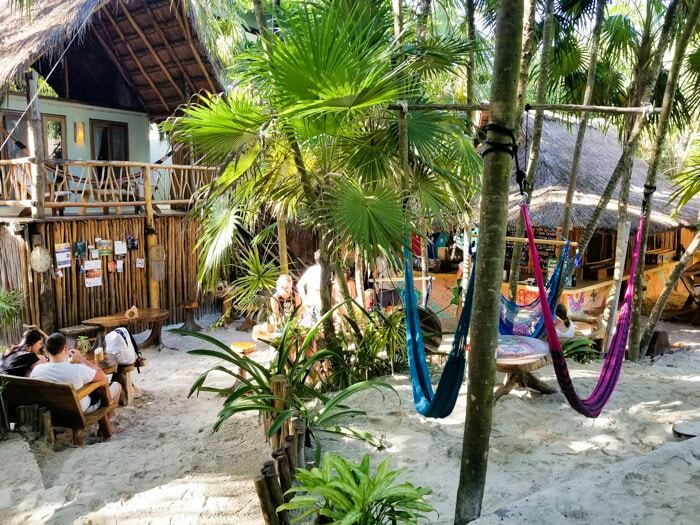 El Nicho is right beside the park in Puerto Morelos and is a great spot for a vegan breakfast or lunch. You can order a vegan breakfast plate with options like beans, avocado, fruit, roasted potatoes and steamed spinach. 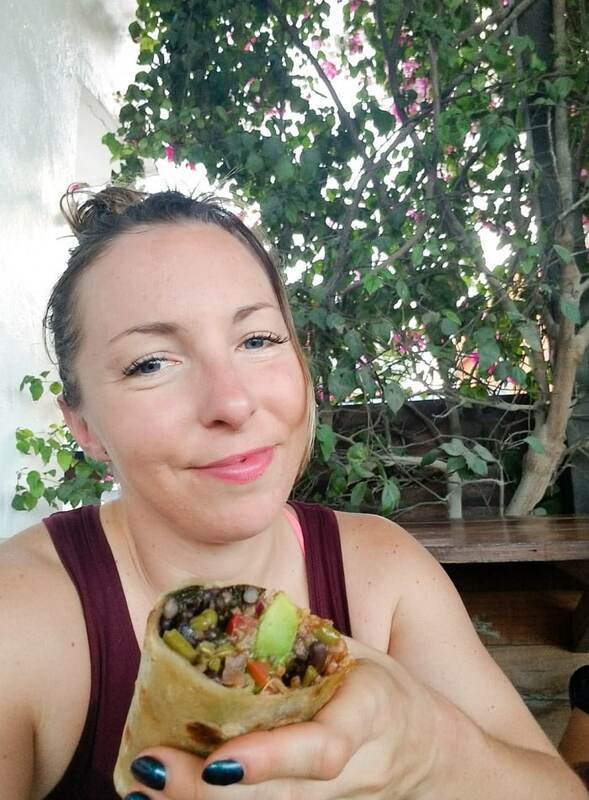 I had some vegan tacos at Tacos.com in Puerto Morelos. They were quite good made with various veggies and apple. Just ask to have them without cheese. 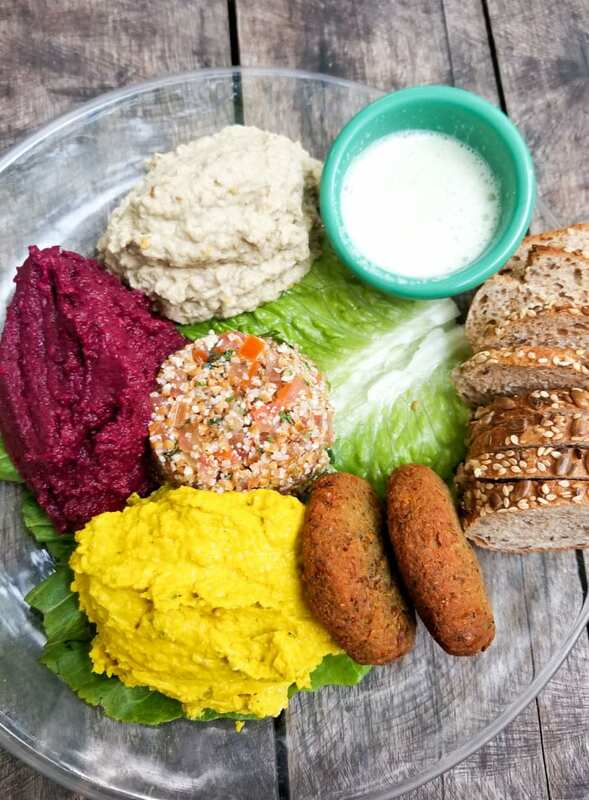 Chez Celine has some nice vegan options for breakfast and lunch including smoothies, quinoa ratatouille, chia parfaits, bagels, avocado toast, salads and sandwiches. They have a nice patio on the main shopping street in Playa del Carmen. Great spot for a coffee and light breakfast. Check out the menu here. 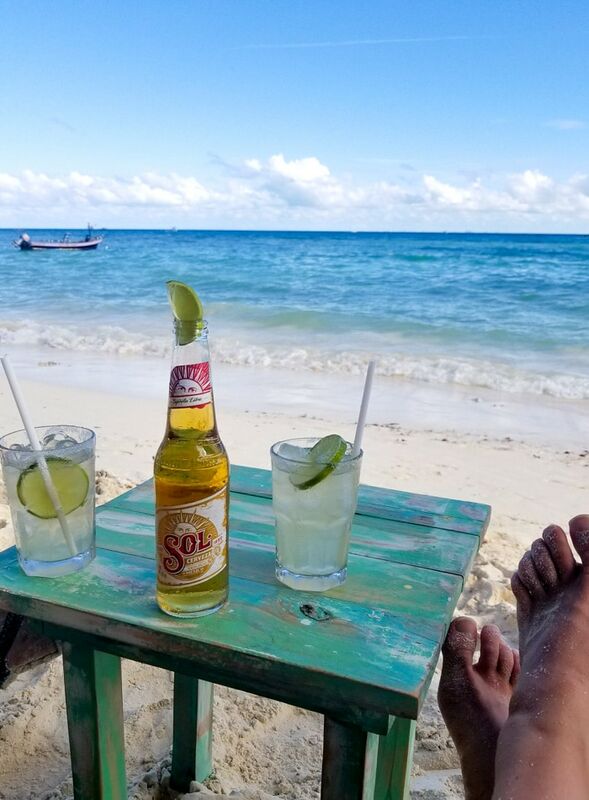 We like this spot on the main beach in Playa because they don’t charge for beach chairs and they have good drinks, a chill vibe and often have live music. We stopped here twice for a drink and a swim on a break from walking around Playa. You’ll find them at the North end of the main beach in Playa. Look for green umbrellas and chairs. 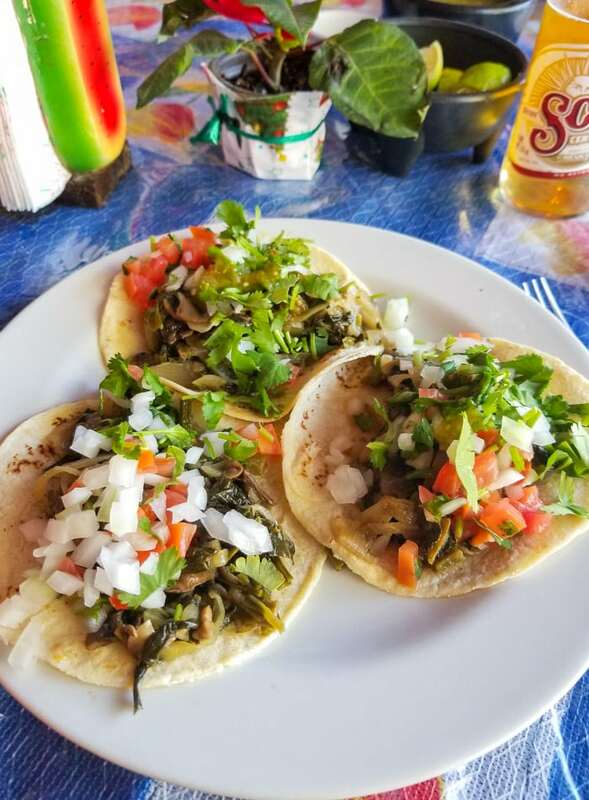 My husband really wanted to go here for tacos as it’s known a one of the best spots for inexpensive Mexican food in Playa del Carmen. It’s most all meat but I was able to order the Alambre Vegetariano without cheese, which were basically veggie fajitas and they were really good. 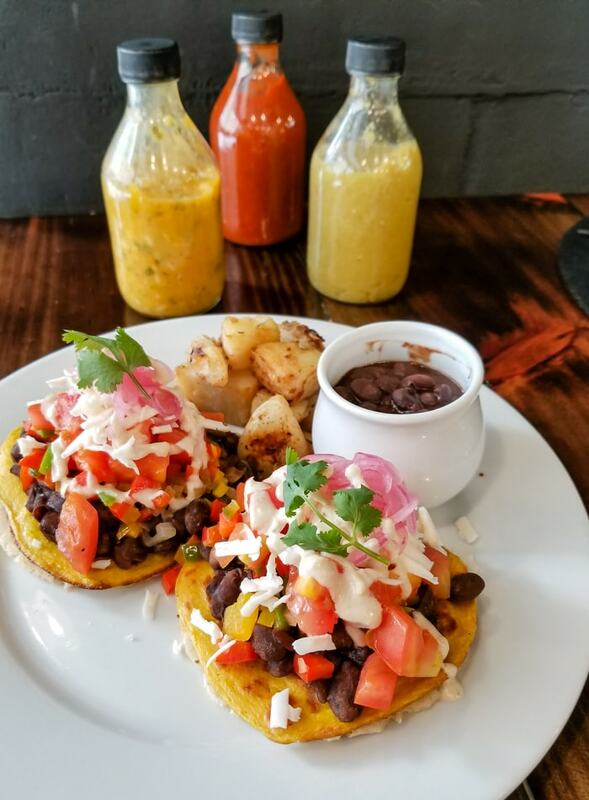 Many of the other dishes could be done vegan so if you speak a little Spanish you’d have no problem getting a torta, tacos or a combination plate. We stopped here for lunch on a Sunday when a lot of other spots were closed. I had veggie tacos here and they were decent. It’s not vegan or vegetarian but they had a number of options on the menu. The staff was very attentive and friendly. There was also a cute cafe next door I would have liked to check out. For this trip, we decided on an all-inclusive for the gym access, beach, pool and free breakfasts. If you’ve never been to an all-inclusive, the buffets are notoriously unhealthy and animal-product heavy. 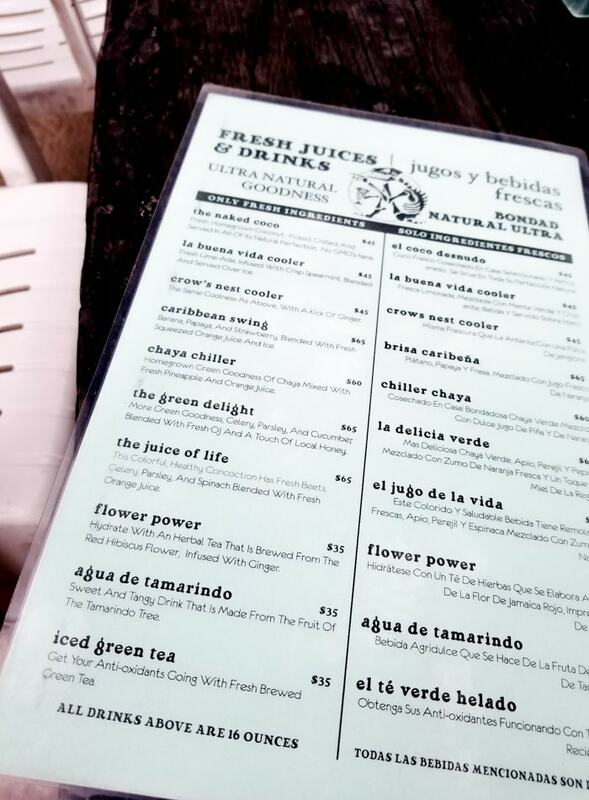 However, after what I’d experienced in the past, I have to say I was pleasantly surprised with the plant-based options available at Barcelo. They even had a vegetarian corner and I was happy to find everything from tofu, to chickpeas, to quinoa, things I’d never seen at an all-inclusive before. I mean, it’s nothing special and you’ll still be pretty limited but it’s totally doable, just don’t expect much variety or options for plant-based protein sources. We only ate lunch and dinner at the resort a couple of times but we ate breakfast there almost everyday. 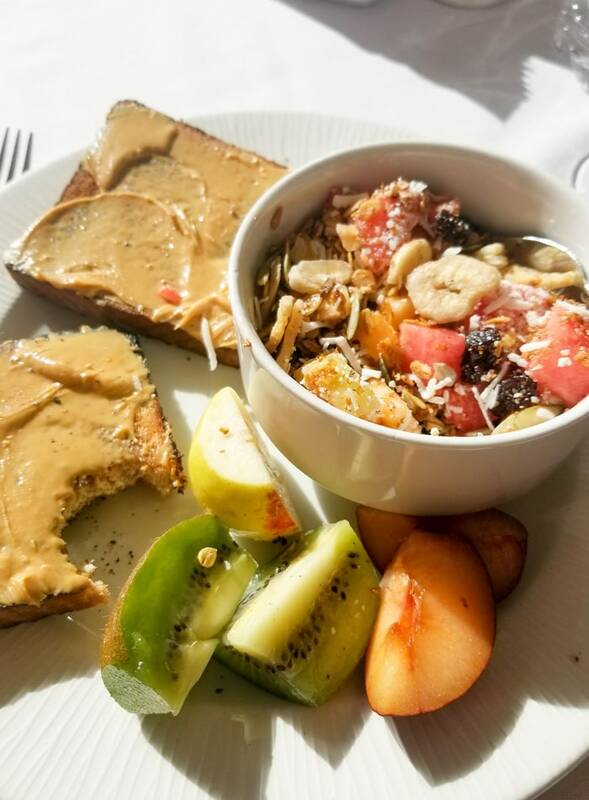 Creating vegan breakfasts at resorts is easy and I actually ate quite similar to what I’d eat at home. You’ll be able to load up on all sorts of fruit, so I would usually create a fruit bowl topped with nuts, seeds, raisins and coconut. Then I’d grab extra papaya, plums, watermelon and kiwi on the side. One day I asked for hot water and made a bowl of oatmeal with fruit and nuts and you can also get fresh fruit smoothies. With my fruit bowls, I’d have an english muffin or toast with peanut butter. They won’t have natural organic peanut butter, so you’ll have to settled for the processed stuff but that’s okay for me for a few days. Depending on the resort, you may be able to find almond or soy milk but most just have dairy milk, in which case I drink black Americanos. I’ve also bought a carton of soy milk in town to keep at the resort before. I usually still bring some of my own food such as protein powder, almond butter, greens powder and some healthy snack bars like Simply Protein. 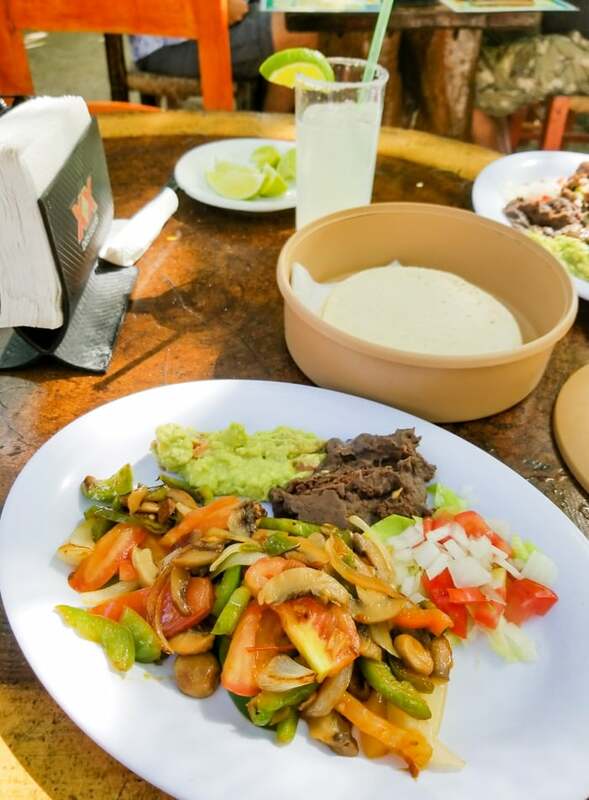 For the lunches and dinners we ate at the the resort, I would make huge salads and veggie plates and pretty much always have some tortilla chips with guacamole and pico de gallo. I was really impressed with the selection of vegetables available. I was able to find about all kinds of greens from spinach to red leaf lettuce, jicama, onions, nuts, seeds, olives, broccoli, cauliflower, steamed beets, raw grated beet and carrot, fresh sprouts and more. For cooked veggies, I could always find steamed broccoli, eggplant, fennel, cauliflower, carrots, green beans, potatoes and plenty of other options. Rice and beans are plentiful so you can load up on those for a little more sustenance but don’t expect to find to many other protein sources. One day I made veggie tacos with rice, black beans and veggies. I also made pasta with tomato sauce, spinach and broccoli. On the unhealthier side, fried foods, sweet breads and baked goods are plentiful but I stayed away from that because I knew it would make me feel crappy. 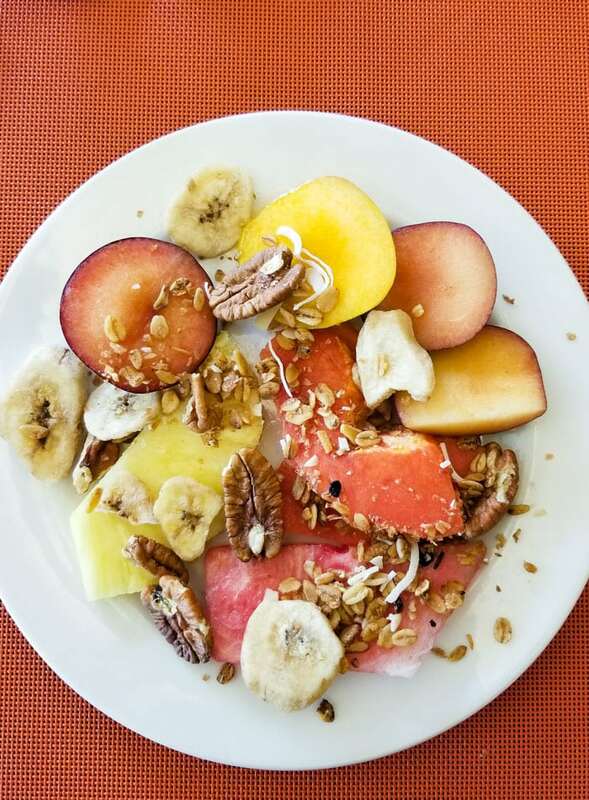 If we had dessert at all, I went for fruit topped with pecans and coconut. We don’t usually use the Al La Carte restaurants as vegan options are typically few and far between but they do exist. 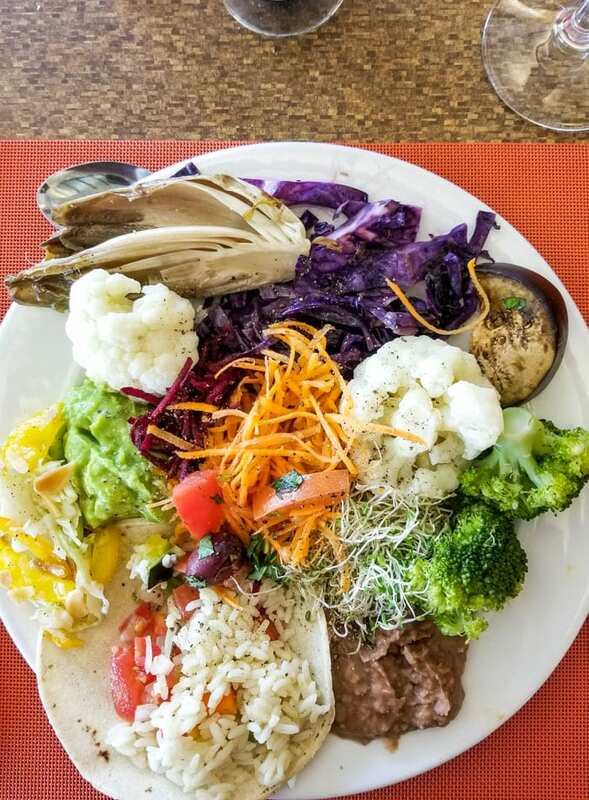 At Marina El Cid in Puerto Morelos they had a number of vegan options available at the French, Italian and Mexican restaurants but like I said, we prefer to eat dinner off most of the time. To be honest, I got a little overwhelmed a number of times. Just seeing the way people eat, the sheer excess and the vast amount of meat being consumed was just too much, not to mention the huge amount of food being wasted. Living in Vancouver, sometimes I forget that’s the norm and how much it hurts to see it up close and personal. And not just the mass amount of animal products being consumed but the obesity and lack of general mobility or ability to move around in functional away. It reminded me that we have such along way to go still as far as education and helping people feel better so they can enjoy a better quality of life. It actually inspired me to get back home and back to work sharing information that might help people make positives changes to feel better inside and out. Staying active on resorts is easy. Most have decent gyms, fitness classes and are big enough you end up walking a lot. Barcelo is huge so we walked a lot and the new gym is beautiful. They have everything you could ever need for an awesome workout. Squat racks, boxes, barbells, bench press, medicine balls, plenty of room for bodyweight workouts, spin bikes, treadmills. I was able to more or less keep up my regular training. Maintaining an exercise habit on vacation is really important to me so I loved that. We started every day with a workout followed by a swim in the sea and a healthy breakfast. That part of the resort was awesome. The last time we went to an all-inclusive we said it would be our last but once again we ended up back at one. They certainly have their conveniences. For us it was the ability to start every day at the gym followed by a healthy breakfast. Barcelo has perfect, stunning, white sand beach and beautiful pools to enjoy but I don’t think we’ll be back at all-inclusive anytime soon. Backpacking, AirBnb and cheap hotels is more our style but sometimes it’s nice to go on “vacation.” Either way, we had an incredible time on this trip. We spent most of our time off the resort and everything is still fairly close by collectivo (public transportation) that’s it’s easy enough to get wherever you want to go. Next time we go the area, we’ll rent an apartment with a kitchen and a car so we have more flexibility to get around and explore further up and down the coast. 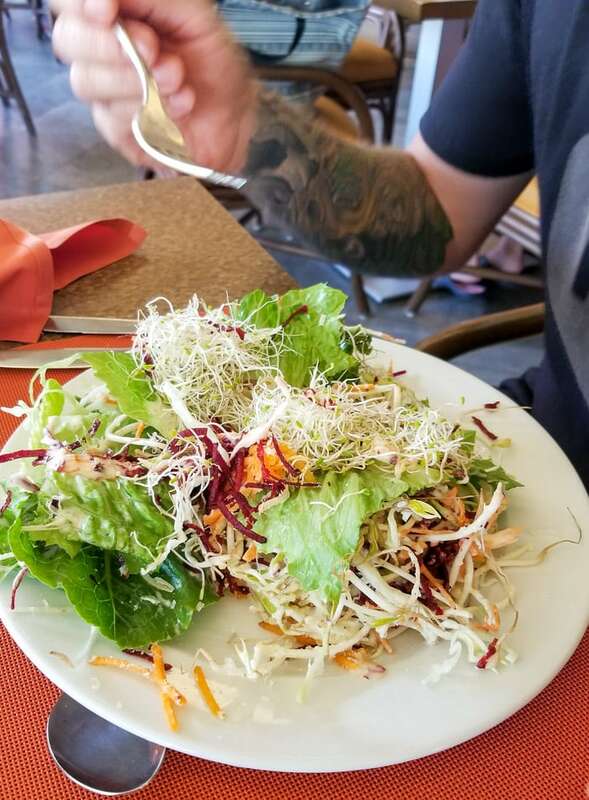 If you do find yourself at an all-inclusive in Mexico though, know that it’s totally possible to eat plant-based. 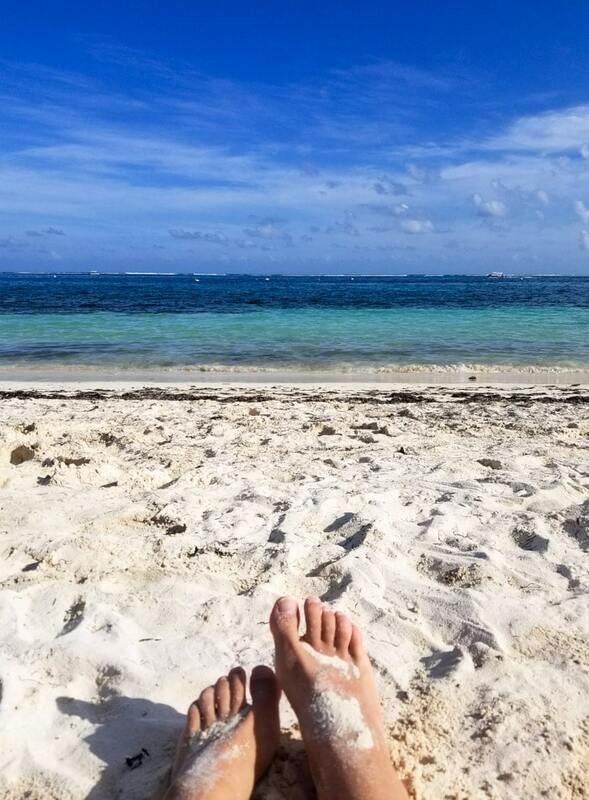 Very informative post.Your pictures had my mouth watering and The beach looks so nice as It’s freezing rain here in Vancouver. Haha, I know, I’m in Vancouver too! It’s been so gross out. Which of the Barcelo resorts did you stay at? It’s Barcelo Maya Grand – which is actually made up of 5 hotels on one property, it’s massive. We’ve stayed there a few times over the years and love it because it has the amazing beach, and the new gym is fantastic. Rooms are just so-so but we don’t care about that since we’re always out and about. 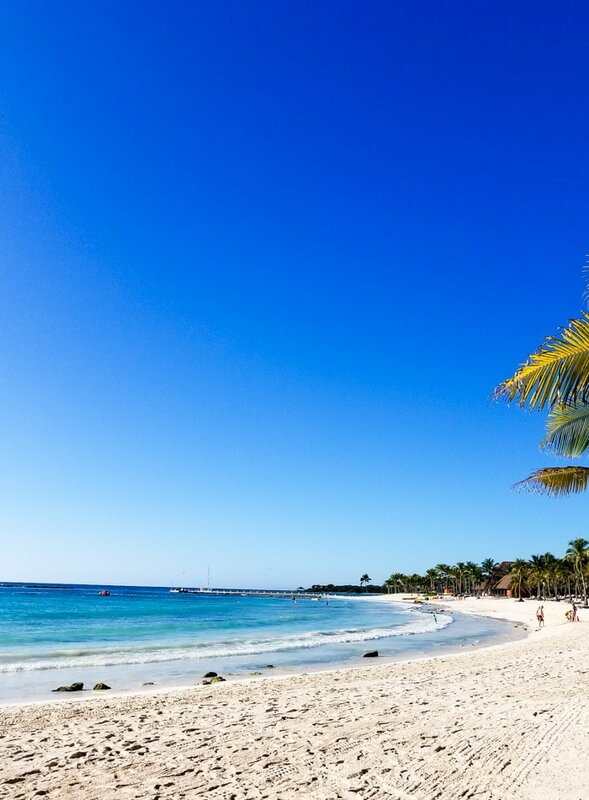 We’ve also stayed at Grand Bahia Principe Coba which we didn’t love, Catalonia Yucatan which is very small and Marina El Cid which is a nice property but doesn’t have the best beach. Have a great trip if you’re going! We’ve been to the area 7 times now so let me know if you have any questions!